There are three main types of average problems commonly encountered in school algebra: Average (Arithmetic Mean), Weighted Average and Average Speed. In this lesson, we will learn how to solve weighted average problems. 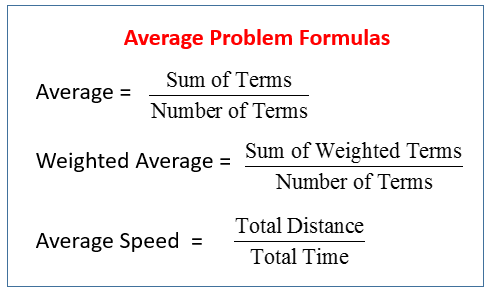 The following table gives the formulas for average problems: Weighted Average, Mean, and Average Speed. Scroll down the page for examples and solutions. One type of average problems involves the weighted average - which is the average of two or more terms that do not all have the same number of members. To find the weighted term, multiply each term by its weighting factor, which is the number of times each term occurs. At a health club, 80% of the members are men and 20% of the members are women. If the average age of the men is 30 and the average age of the women is 40, what is the average age of all the members? How to find the weighted average given a frequency table? A group of people were surveyed for how many movies they see in a week. The table below shows the result of the survey. (a) How many people took part in the survey? (b) What was the total number of movies seen in a week by all the survey takers? (c) What was the average number of movies seen in a week per person surveyed? How to solve Weighted Averages and Mixture Problems? Mixture problems are problems in which two or more parts are combined into a whole. 1. Premium coffee is $9.50/lb, Supreme coffee is $11.75/lb and Blend coffee is $10.00/lb. How many pounds of Premium coffee beans should be mixed with two pounds of Supreme coffee to make Blend coffee? 2. A car's radiator should contain a solution of 50% antifreeze. Bo has 2 gallons of 35% antifreeze. How many gallons of 100% antifreeze should he add to his solution to produce a solution of 50% antifreeze? How to solve Weighted Average Word Problems? 1) How many pounds of mixed nuts selling for $4.75 per pound should be mixed with 10 pounds of dried fruit selling for $5.50 per pound to obtain a trail mix that sells for $4.95 per pound? 2) A chemistry experiment calls for a 30% solution of copper sulfate. Kendra has 40 milliliters of 25% solution. How many milliliters of 60% solution should she add to make a 30% solution? 3) A car and an emergency are heading toward each other. The car is traveling at a speed of 30 mph or 44 feet per second. The emergency vehicle is traveling at a speed of 50 mph or about 74 feet per second. If the vehicles are 1000 feet apart and the conditions are ideal, in how many seconds will the drive of the car first hear the siren?